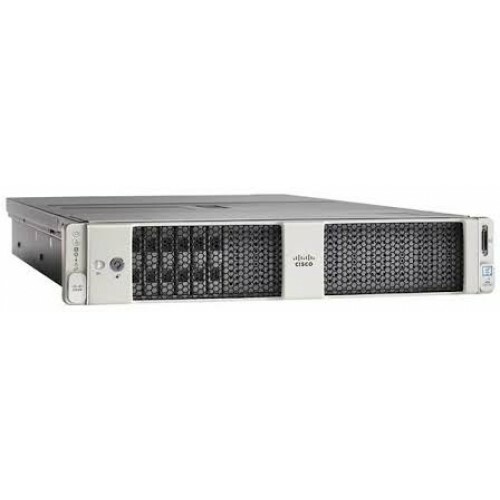 Cisco UCS-C240-M5S 2RU rack server (10 Core) With 2x Intel Xeon Silver 2.2 GHz 4114/85W 10C/13.75MB Cache/DDR4 2400MHz. Chassis with Up to 8 SFF + 2 rear drives for 2CPU Configuration. 4 x 32GB DDR4-2666-MHz RDIMM/PC4-21300/dual rank/x4/1.2v.Remote Management IMC SW (Recommended) latest release for C-Series Servers. 5 x 1.2 TB 12G SAS 10K RPM SFF HDD. Cisco 12G Modular RAID controller with 2GB cache. Cisco UCS 770W AC Power Supply for Rack Server, Dual. Power Cord Jumper, C13-C14 Connectors, 2 Meter Length.Dual 10GBASE-T Intel x550 Ethernet ports.Intel i350 Quad Port 1Gb Adapter. Ball Bearing Rail Kit for C220 & C240 M4 & M5 rack servers. Media Drive (DVD) for C240 M5 Servers (8 HDD version only).